Location of Leesville in Vernon Parish, Louisiana. Leesville is a city in, and the parish seat of, Vernon Parish, Louisiana, United States. The population was 6,612 at the 2010 United States Census. It is part of the Fort Polk South Micropolitan Statistical Area and is additionally served by the Leesville Airport. The city is home to the Fort Polk U.S. Army installation. The populations of Fort Polk and Leesville, if combined, would result in a city with a population of more than 20,000. Leesville is located at 31°8′37″N 93°16′16″W﻿ / ﻿31.14361°N 93.27111°W﻿ / 31.14361; -93.27111 (31.143553, -93.271196) and has an elevation of 254 feet (77.4 m). According to the United States Census Bureau, the city has a total area of 5.49 square miles (14.2 km2), of which 5.45 square miles (14.1 km2) is land and 0.04 square miles (0.10 km2) (0.55%) is water. This climatic region is typified by hot, humid summers and mild winters. According to the Köppen Climate Classification system, Leesville has a humid subtropical climate, abbreviated "Cfa" on climate maps. As of the census of 2000, there were 6,753 people, 2,841 households, and 1,650 families residing in the city. The population density was 1,238.7 people per square mile (478.4/km²). There were 3,389 housing units at an average density of 621.7 per square mile (240.1/km²). The racial makeup of the city was 55.49% White, 35.33% African American, 1.47% Native American, 2.09% Asian, 0.56% Pacific Islander, 2.25% from other races, and 2.81% from two or more races. Hispanic or Latino of any race were 4.92% of the population. There were 2,841 households out of which 29.0% had children under the age of 18 living with them, 36.2% were married couples living together, 18.3% had a female householder with no husband present, and 41.9% were non-families. Nearly 36.7% of all households were made up of individuals, and 11.4% had someone living alone who was 65 years of age or older. The average household size was 2.29 and the average family size was 3.02. In the city, the population was spread out with 26.1% under the age of 18, 11.0% from 18 to 24, 28.6% from 25 to 44, 20.5% from 45 to 64, and 13.9% who were 65 years of age or older. The median age was 34 years. For every 100 females, there were 96.0 males. For every 100 females age 18 and over, there were 91.4 males. The median income for a household in the city was $23,864, and the median income for a family was $30,435. Males had a median income of $27,267 versus $21,661 for females. The per capita income for the city was $14,360. About 24.5% of families and 28.7% of the population were below the poverty line, including 42.0% of those under age 18 and 15.1% of those age 65 or over. The Vernon Parish Public Library operates the Main Library and the Dunbar Branch Library. Eddie Fuller - NFL player, running back with the Buffalo Bills, also played for Louisiana State University and was part of the play which became known as the "Earthquake game". Demond Mallet - Professional basketball player, guard. Played in the German League and currently with Spanish Joventut Badalona. Jim Mitchell - horse breeder and judge of the Louisiana 30th Judicial District Court in Leesville from 2009 until his death in 2015. Keith Munyan - Born in Leesville in 1961 but moved away as a toddler, he is a Los Angeles photographer known for his multiple celebrity clients. ^ "City of Leesville, Louisiana". City of Leesville, Louisiana. Retrieved August 26, 2012. ^ "Weatherbase.com". Weatherbase. 2013. Retrieved on October 8, 2013. ^ "Sexual Predator Policy." (Archive) Vernon Parish Library. Retrieved on March 23, 2013. 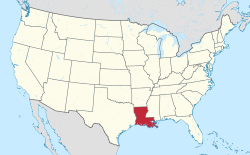 ^ "Membership in the Louisiana House of Representatives, 1812-2016: Vernon Parish" (PDF). house.louisiana.gov. Archived from the original (PDF) on October 6, 2014. Retrieved October 22, 2014. ^ "James Armes, III's Biography". ProJect Vote Smart. Retrieved April 20, 2015. ^ "Michael Ford #42". LSU Football. Retrieved November 26, 2012. ^ "Eddie Jerome Fuller". databaseFootball.com. Retrieved November 26, 2012. ^ "Bo Harris". databaseFootball.com. Retrieved November 26, 2012. ^ "Carolyn L. Huntoon". energy.gov. Retrieved November 30, 2013. ^ "Obituary: Judge James "Jim" Mitchell". Leesville Daily Leader. Retrieved July 26, 2015. This page was last edited on 6 March 2019, at 16:24 (UTC).